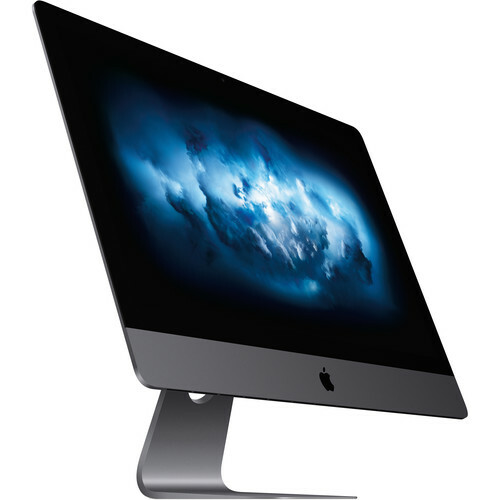 Featuring a 3.2 GHz Intel Xeon W 8-core processor and 64GB of 2666 MHz DDR4 ECC RAM, the iMac Pro is designed to handle demanding pro workflows such as pro photo work, pro video editing, advanced graphics editing, virtual reality content creation, and real-time 3D rendering. The iMac Pro also has 4TB of all-flash storage, which has a 3.3 Gb/s read speed and a 2.8 Gb/s write speed, for loading huge files and launching apps faster. In addition to a workstation-class processor, the iMac Pro also provides workstation-class graphics thanks to the dedicated AMD Radeon Pro Vega 56 graphics card. With up to 8GB of HBM2 (High-Performance Memory) VRAM and a 400 MB/s memory bandwidth, the Radeon Pro Vega 56 GPU delivers up to 11 teraflops of single precision and up to 22 teraflops of half precision. The iMac Pro houses an Intel Xeon W processor with 19MB cache. Its 8 cores can reach a base speed of 3.2 GHz. The CPU can also be boosted up to 4.2 GHz, thanks to Turbo Boost. With AVX-512 vector instructions and an improved cache architecture, the Xeon W processor can handle even more data at a faster pace. Combined with 64GB of 2666 MHz DDR4 ECC RAM, you can render images, edit up to 8K videos, manipulate photos, create real-time audio effects, or compile your next app quickly and efficiently. Featuring a dedicated AMD Radeon Pro Vega 56 GPU, the iMac Pro brings workstation-class graphics to the iMac form factor. With the Vega architecture and a large 400 MB/s memory bandwidth provided by the 8GB of HBM2 (High Bandwidth Memory) VRAM, the iMac Pro delivers a major jump in performance — up to three times faster than the GPU found in the 2013 Mac Pro. This translates to higher frame rates for VR, real-time 3D rendering, realistic special effects, and gameplay at max settings. It also supports both single- and half-precision computing, so operations that don't require full 32 bits of precision can be performed twice as fast. This means the GPU can deliver up to 11 teraflops of single precision and up to 22 teraflops of half precision. Box Dimensions (LxWxH) 30.0 x 25.0 x 10.0"